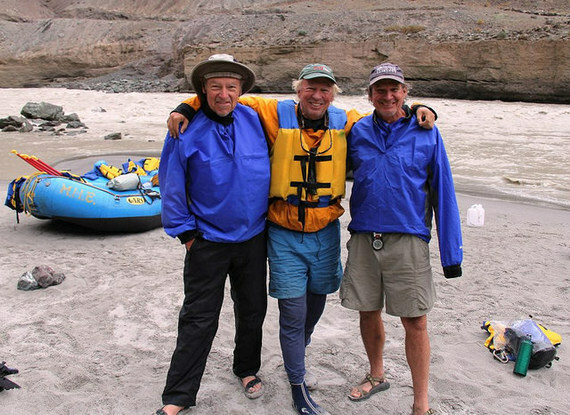 George Wendt (1941-2016), my long-time friend and partner, was defined and driven by a holy curiosity, an incurable case of the Quest, always seeking, always exploring, never content with an unturned corner, or unrun stretch of river. Match at the ready, he was ever eager to light the wick in the candle of understanding, even if it set the tent on fire. He was generally the quiet one in the room, a deep listener, but one with a Socratic list of questions. And the screwier the response, the madder an idea, the more he wanted in. I threw so many wacky ideas at George, not the least of which was partnering in an international adventure company called Sobek, yet every time his eyes grew wide, and he wanted to be in the boat. He helped make the most outrageous ideas navigable. John Yost and I concocted the idea of Sobek in my mother's basement, but we had no money, only big ideas, initiative, enterprise and nepotism (John's father was in the foreign service and we were able to get our rafts to Ethiopia free in the diplomatic pouch). When, as a 23-year-old dreamer, I returned from making first descents down some crocodile-infested rivers in Africa, I was broke, and wrote to all the Grand Canyon outfitters to see if anyone might be interested in becoming a partner in a new crazy international adventure company by investing some rafts and guides. Only George responded, and he become a full partner, and we pioneered many rivers around the world together, from the Bio-Bio in Chile to the Alas in Sumatra, and so many more. When George put skin into Sobek, I moved to Angels Camp, and set-up shop in his basement beneath a single bare lightbulb, and in front of an ancient manual typewriter. We had adjacent card tables, and from there we produced our first brochure, and sold and organized the first trips, rafting down the Omo River in Ethiopia. It was the opening chapter in the book of international adventure travel, and George was a quiet co-author. My first Thanksgiving in Angels Camp George called and said the Feather River, which had been dammed, was doing a release over the holiday. Wednesday night George disappeared a raft from the warehouse, we hopped in the van, and made the four-hour drive north, and made the run. On the way back we stopped at McDonalds, and George ordered two Big Macs. "Best Thanksgiving ever," he said. That Christmas I asked George if I could borrow the OARS van to drive to visit my family in San Diego. Somewhere south of Los Angeles I picked up a couple of hitchhikers...it was Christmas Eve. They piled in the back, lit up a joint, and gave me their drop-off point. I let them off on the outskirts of San Diego, and pulled into a gas station, where I looked in the back in horror to discover the hitchhikers had stolen all the Christmas presents for my family. They'd also cribbed an OARS hand pump. I called George with the news and he said, with equanimity and characteristic compassion, "Look in the glove compartment. There's an envelope with $100 emergency cash....use it to buy gifts for your family." And over 40 years later, George was still exploring, probing, paddling the outrageous, always ready for a new canyon to descend. With John Yost, the other point in the trine, we ran the Zanskar in Ladakh, India a couple years back, his head thrown back in constant awe. Last year we descended a trio of wild rivers in Laos and Thailand, and during once George capsized and made a long swim through a gauntlet of rapids. But he was fine with the adventure....he'd been through worse many times...and was back in the boat paddling away in minutes, saying his signature "Thank you" to the river for allowing him the experience. This was his unquenchable spirit, and his passion. We were planning the next expedition, a wild run in Japan, when he eddied out. I owe so much to George. If I said there was an unexplored river in heaven, he would say, "Let's go do it!" And a couple of rafts would disappear from the warehouse.